BeFrugal Review: How Did They Stack Up? BeFrugal, said to be the “#1 site for cash back and coupons,” is one of the many websites that offer you cash back for the purchases you already were going to make online anyways. And if you happened to click on this review and have no idea what BeFrugal is, let me explain. 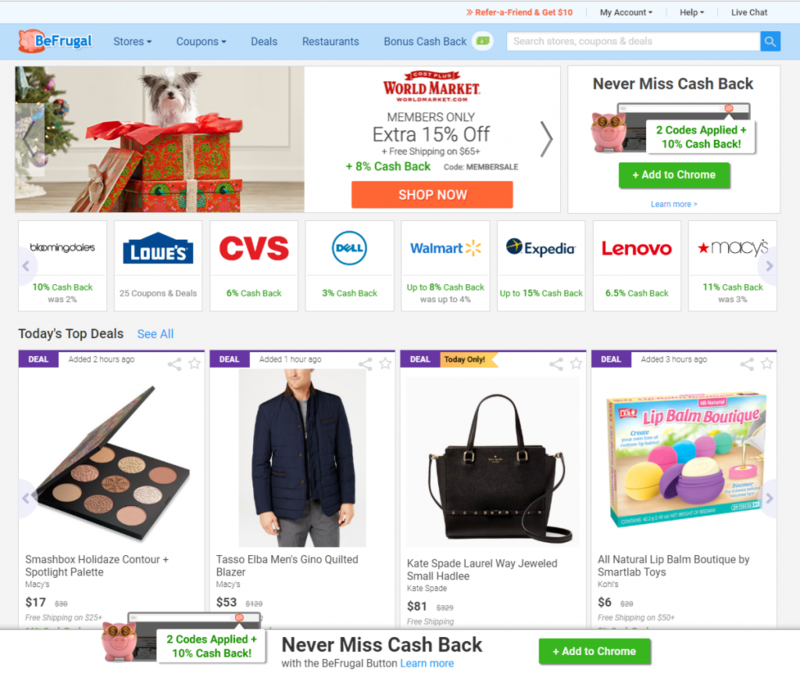 In simple terms, BeFrugal is primarily a cashback website that will give you back a portion of your purchase price when you click on the special link on your dashboard. They are based in Boston and have been around since 2009, founded by Jon Lal. So, for example, if you were going to shop at Dell online, you would want to see if BeFrugal had them in their database, which, in this case, they do. In fact, they would give you 3% cash back on your purchase as long as you click on the link on your BeFrugal dashboard to ensure they can track it to give you the proper credit back. As iwth any cashback website, this is important as failing to do so doesn’t allow the company to track you. So if you spent $1,000 on a brand new laptop, BeFrugal would give you $30 back just for clicking on their link! Today, BeFrugal works with over 5,000 retailers, so there’s a good chance they will work with a lot of retailers you already shop with, saving you even more. All cashback websites work in a similar way, but not all are created equally as some may offer a better cashback rate than another. I will get into this later. The same can be said about features. Aside from cashback offers, BeFrual also offers coupons, deals, restaurant deals and bonus cash back, all of which I will get into on this review. HOT: Follow this link and BeFrugal will give you $10 for FREE after you earn $10! Signing up is extremely easy to do as all the company asks for is your email and a password to start. Be sure to sign up with our special link as you will get a $10 bonus when you earn at least $10 in cash back. The company is 100% free to use, and after you provide your email and create a password, you can instantly access your dashboard. It all takes less than 30 seconds to do. 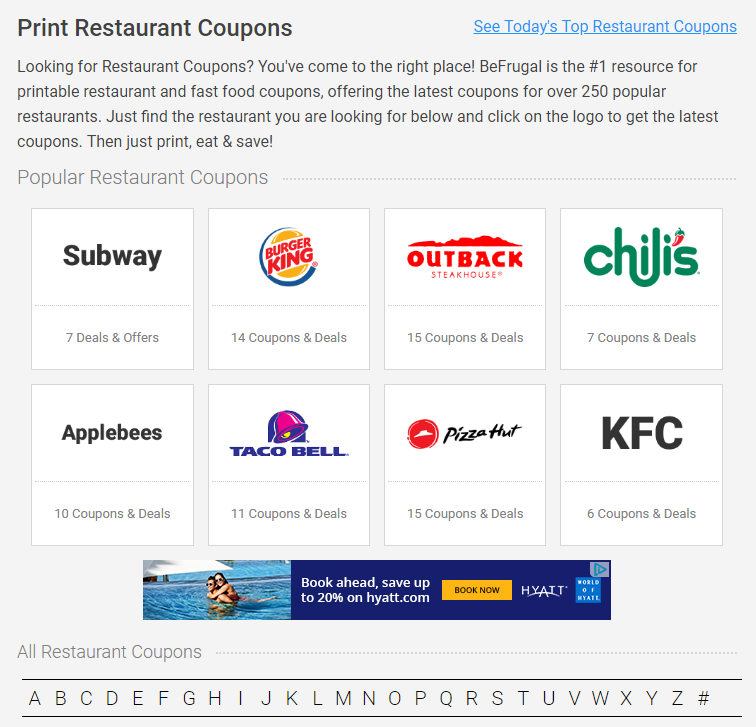 As you can see from the screenshot, you can either choose from a variety of options on your top menu or you can scroll the main page which highlights the top deals, best online coupons for the day and today’s top restaurant coupons. For me, I usually just go straight to a retailer I may make a purchase with. Each subsection showcases a few offers, but you can click on the “See All” tab to see all of the best deals for the day. While BeFrugal does offer coupons, deals and restaurant offers, the only reason you should probably use the website is for the cash back opportunities. To date, BeFrugal works with more than 5,300 stores, making it one of the biggest online as mentioned. Yes, even beating the powerhouse, Ebates and many other competitors. This doesn’t mean it makes them the best option, however. Now, to earn cash back on BeFrugal, it’s pretty simple. You can either click on the “Stores” tab at the top (as seen in the screenshot below) to browse stores by letter or category or you can search for stores using the search bar tool. This is what most people will do since you probably already know who you’re going to shop with. If you have a particular retailer in mind, I would just recommend you use the search bar tool to see if the company works with them. As you type the retailer’s name, it should show up in the autosuggest part, which you can then click on to go to the retailer’s specific cashback page. But in the case, the company doesn’t work with the company, then you will not see the name show up in the autosuggest area. Just remember that BeFrugal isn’t the only game in town, so if you don’t see the particular retailer on this website, it could be on one of the many other competitors. I will talk about that later. So if a retailer is listed and you will click on it, you will then be presented with a variety of cashback options. Some retailers are relatively straightforward and you will earn X% cash back, whereas other retailers may offer varying amounts depending on what you purchase. As you can see, if you spent money in the sports and outdoors department, you would get 8% at that time, but if you spend money in books, you would only get 1.33% cash back. In this case, the “up to 8% cash back” is kind of misleading since most of your purchases will only net you 1.33%. This is why it’s SO important to read the terms. 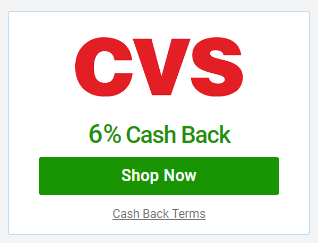 But with CVS, on the other hand, they offer a flat 6% cash back, regardless of what you buy. This is much easier. Just make sure you pay close attention to the details to make sure you know exactly how much you’re going to get back with your purchase. And remember, if you’re happy with that rate, ALWAYS click the “Shop Now” link so that the company can track you. And don’t forget to save your receipt for evidence in the case the website doesn’t credit you. 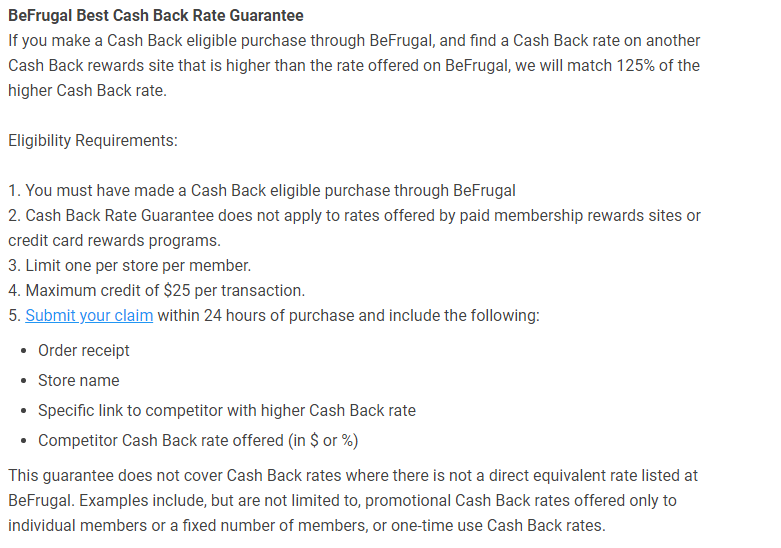 Now, what makes BeFrugal much different than many of its competitor is that they offer the best cash back rate and if you find a cashback rate that’s higher than theirs, they will MATCH 125% of the higher cash back rate. This is pretty good, but I can’t stress this enough, whenever you use one of these websites, ALWAYS save your invoices in case the cashback doesn’t post. This happens much more often than you think. You have to make a cash back eligible purchase through the BeFrugal website. The guarantee DOES NOT apply to rates offered by paid membership sites or credit card rewards programs. Only one store per member. A maximum credit of $25 per transaction. You must submit your claim within 24 hours of your purchase, including your order receipt, the store name, specific link to the competitor and the rate offered. Now, this is a great deal, seeing they will match 125%, and in many cases, BeFrugal IS NOT the best rate in town. You will see my comparison soon. So if you want to take advantage of this 125% match, I wanted to show you a very easy trick you can use to see if they are, indeed, offering the best rate. 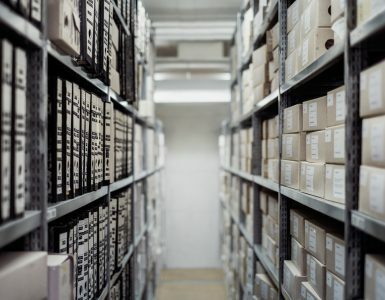 As long as you have a retailer in mind, the first thing you’re going to want to do is either visit CashBackMonitor or CashbackHolic. Both of these websites are 100% free and what they do is scan ALL cashback websites and show you the best rates on the market right now. These rates are updated almost in real-time and are an extremely great source if you want to maximize your cashback savings. These websites work in the same way, but for my example, I will use CashBackMonitor, simply because I like the interface better. Now, using the CVS example above, let’s pretend I want to make a purchase for $100. I already know BeFrugal will offer me 6% back, but I just want to make sure I’m getting the best deal. And what do you know, BeFrugal isn’t offering the best rate! Ebates is at a whopping 12% — double the value. So now, you have two options. You can either use Ebates and take the 12% without having to worry about submitting your receipts, etc, or you can go through the hassle of submitting the paperwork to essentially get 15% cash back with BeFrugal since they would give you 125% back. Just remember that you can only get $25 cash back maximum if taking advantage. In my example, if I went to Ebates (yes, I’m a member), I would get $12 back on my $100 or $6 with BeFrugal if I didn’t do my research. Personally, I would save the headache of submitting receipts and just use Ebates, but that’s just me. There’s no right or wrong answer here because it greatly depends on how much work you’re willing to do. In the end, do keep in mind that BeFrugal, in some cases, can offer the best cash back rate, while in other circumstances, they may offer one of the worse. So regardless, just make it a habit to use these tools to make sure you’re getting the best cash back rate. 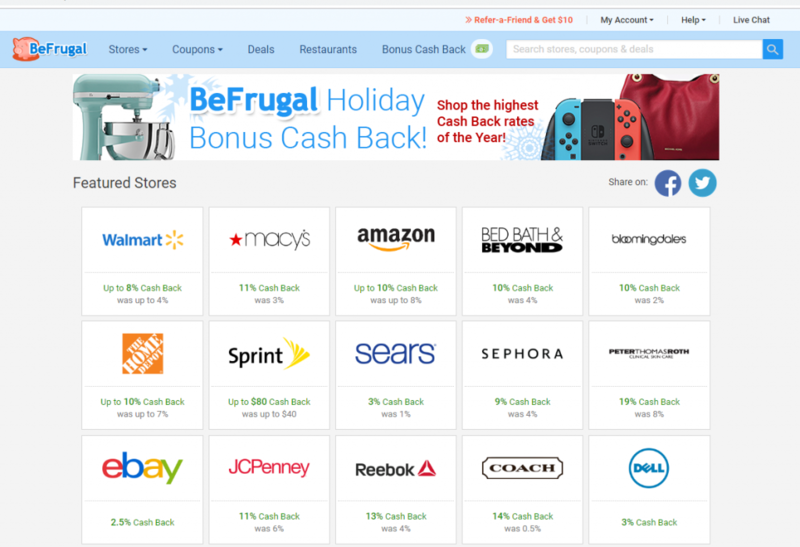 From time to time, BeFrugal offers bonus cash back with certain retailers, all of which can be found on the “Bonus Cash Back” tab in the top menu selection. Quite random, when I glanced at the list, there were about 90 retailers or so that you could get up to double the cash back. It doesn’t hurt to check it out to see the bonuses, but usually, since you probably already have a retailer in mind, it more than likely won’t be that beneficial. If you’re a user of Chrome, then you could also consider downloading the free BeFrugal Add-on. 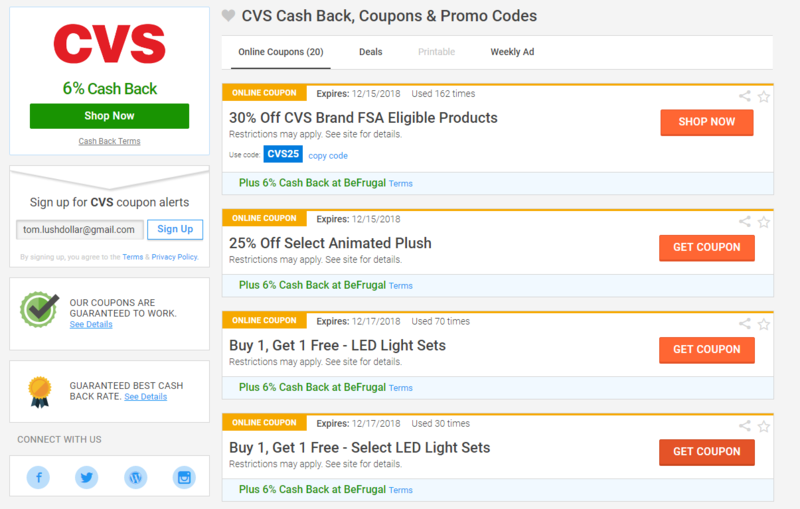 This add-on alerts you of any coupons and/or cash-back deals anytime you land on a retailer’s website, working as a good reminder if you’re forgetful like I am. It’s completely optional, however. Aside from the alerts, it also lets you print coupons and access the weekly flyers. It’s free to download and could a benefit if you want automatic reminders from BeFrugal. But for me, I just make it a habit to check out these websites because I’m not a fan of extensions in general, but that’s just me. Aside from the Chrome extension, the website also offers a free app for your phone as well if you’re more of a mobile user. So, How Did BeFrugal Stack Up? Out of the 20 random popular retailers I picked out, BeFrugal offered the best rate with only two. Remember, though, that these rates constantly change, so take it with a grain of salt. 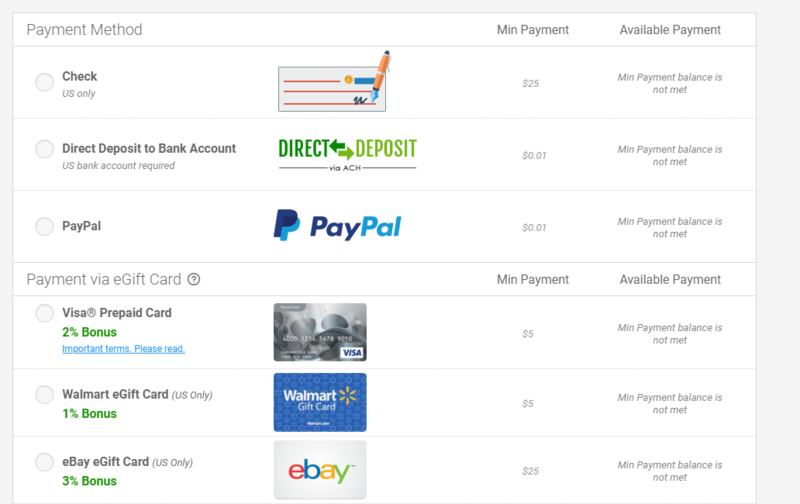 I just wanted to show you how their rates compare with the many other retailers online when I was writing this review and why it’s so important to compare other cashback sites. So the lesson here is ALWAYS to make sure you compare and take advantage of the best rate guarantee if you do decide to get cash back. And like most of your popular coupon websites, you can search for a retailer you had in mind and see what coupons are currently available. Regardless of which retailer you search for, you will be brought to the retailer’s main store page on the website and will be presented with the cash back offers as well as the coupons, deals, printable coupon options (if any) and the weekly ad. Like most coupon websites online, it won’t present you with a coupon code; instead, you will be forced to click on the coupon in order to use it. This is done because it’s the only way the website can get its commission. No clicks. No commission for the website. 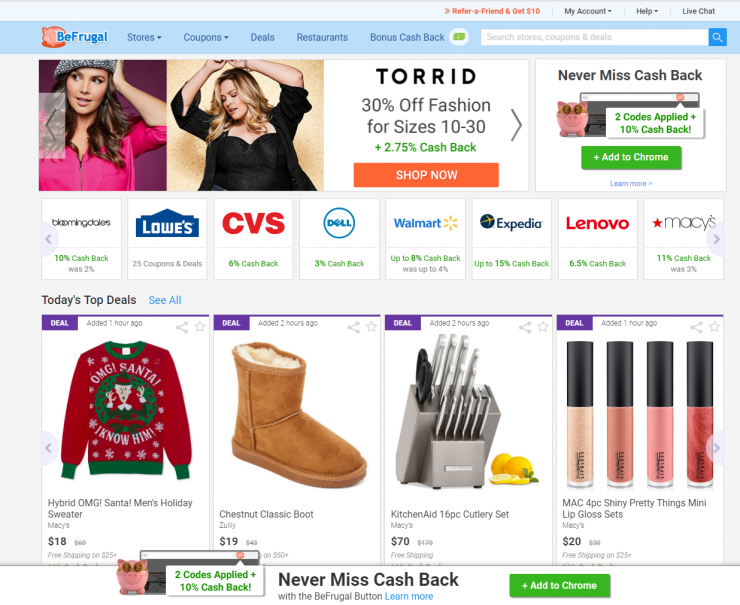 And yes, while it can be annoying, the coupons section seemed to be okay, but I wouldn’t say it’s the best as there are many coupon websites online that are much better in my opinion. Just like the cash back guarantee, BeFrugal guarantees that their coupons will work on the website. According to the company’s terms and conditions, they will add $5 to your account if the coupon you attempted to use didn’t work after you made your purchase. If you do end up seeing a coupon you like on the website, just make sure you click on the specific coupon link for tracking purposes. The “Deals” subsection, also listed on the retailer’s page and in the top menu navigation, will often point out some of the best deals the retailer currently has to offer, working like a deals website in a way. If you’re familiar with Slickdeals or any deals-like website for that matter, it’s going to work in the same manner, but from my quick research, the deals are not as plentiful as other deal websites, so I would use it was a side of caution. 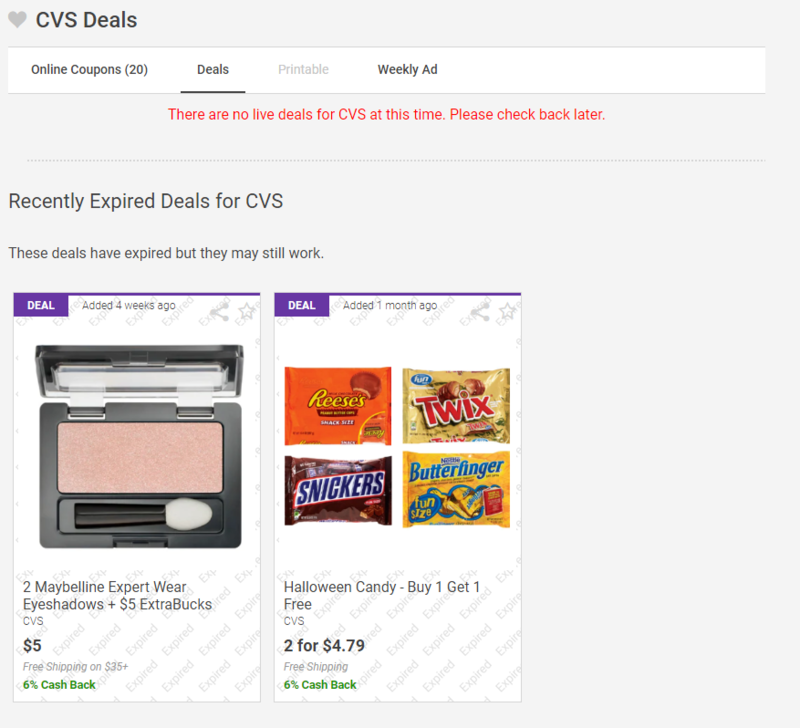 For example, while I was exploring the website, they did not have any live deals for CVS, but you could see deals of the past, such as the one being a buy one, get one free candy offer. 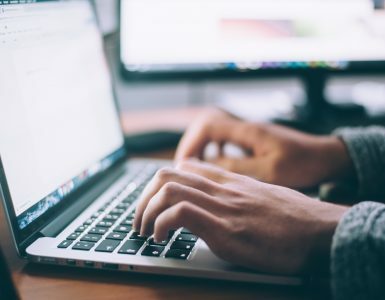 There are a lot of great deals websites on the web, but, again, I recommend you check out my 50+ best coupon websites and scroll to the bottom to see which deal websites I recommend. BeFrugal can be okay for deals but it’s definitely not my #1. It doesn’t hurt to check, though! As yet another option on the retailer’s page, BeFrugal also lets you explore the printable coupon opportunities. And while the selection seemed to be slim, probably because they don’t make much from these deals, it doesn’t hurt to look if you want to print a coupon and redeem in store. Now, remember, if you make your purchase in store, you cannot get cash back, kind of defeating the purpose of the website. While the section is a nice touch, I would not recommend BeFrugal as a printable coupon resource, but that’s okay. We’re here for cash back. As the last section on a retailer’s page, you can find a weekly ad, which can come in handy if you simply want to explore the deals you can find both in-store and online. And while you can find these ads on the retailer’s official website, it’s a nice touch if you want to stay in one place and take a gander at the deals. While most of these weekly ads will be for in-store offerings, again, it won’t help you much if you’re looking for cash back opportunities, but, again, check it out if you’re curious. On the top menu, BeFrugal also offers a variety of restaurant coupons you explore, with over 250+ restaurants to choose from. And while it would be nice to get cash back with a restaurant purchase, it isn’t going to be possible with this type of website since you have to make a purchase in the restaurant rather than online. However, if you had a cash back credit card, you could get cash back in that regard, but that’s a whole another post. Find a restaurant of interest or scroll through the list. And if you see a restaurant you like, you can click through and see more information as to take advantage of the offer. Most of the time, it’s either a special promotion through the restaurant or you may need to print out a coupon to take in. While this section is a nice touch, again, it’s not the best restaurant coupon resources online, but it’s definitely worth checking out if you enjoy eating out. As yet another way to make money, BeFrugal, like most of its competitors, will let you refer your friends and earn $10 in doing so. To refer a friend, you will just click on the “refer a friend, get $10” link at the top to get your special URL. Then, anytime someone clicks on that special link, you will get $10 as long as they meet the terms, usually meaning your referral has to earn at least $10 in cash back. 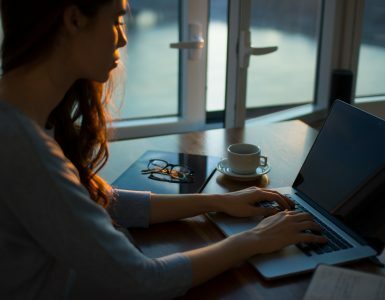 So if you know of family or friends or even have a popular blog/social media following, then you may want to consider this route to earn even more. Just make sure you follow the terms and conditions and never spam. Doing so can just lead to termination. Play nice! Ah, the whole reason you’re probably using the website — getting paid. Once you earn $0.01 — yes, $0.01 — BeFrugal will let you cash out, either via direct deposit or Paypal. This is one of the lowest payout thresholds in the industry, so that’s a nice touch. But, that’s not all as BeFrugal does have a variety of other options, such as gift cards, that you can choose as a payout option and you can receive a cash back bonus in choosing that option, giving you even more for free. For example, if I had $10 in my account and chose a Sephora gift card as my payout, BeFrugal would give me a 6% bonus. If I chose Kohl’s and had at least $5 in my balance, then I could get a 5% bonus. From what I saw, the list of gift cards was quite extensive and could be a fantastic choice if you wanted to get even more for your payout. In the end, when it comes to a payment, it’s rather easy. Once BeFrugal confirms your purchase and credits your account, it’s up to you to either redeem it or wait until piles up. From there, you can choose a check ($25 minimum), direct deposit ($0.01 minimum), Paypal ($0.01 minimum) or a variety of gift cards with bonus options! Getting paid to shop — free money! In my research, I would say the website is OKAY and is worth giving them a shot, especially if you just want to test them out for the sign-up bonus. As you can see in my comparison, they only came in as the best rate for two out of 20 retailers, but you could take advantage of the best rate guarantee as long as you follow the proper protocol. It could take some more work, but hey, you would get 125% more than the top competitor. Just make sure you log it all. In the end, BeFrugal has a lot going for it, and I definitely wouldn’t ignore it. They do offer 5,000+ stores after all. It’s reputable, offers okay rates and could be worth the hassle to get the best rate guarantee. Is it better than Ebates? I would say no, at least in my opinion. Ebates has much better customer service and the cashback seems to post much quicker than BeFrugal. It’s always my #1 choice for most of my purchases. If you used BeFrugal in the past, do let me know how it worked out for you! I would love to hear your thoughts. In the meantime, any time you want to shop, always make it a habit to check these websites to maximize your online shopping experience.